Cardiac tamponade is a clinical syndrome caused by the accumulation of fluid in the pericardial space, resulting in reduced ventricular filling and subsequent hemodynamic compromise. The condition is a medical emergency, the complications of which include pulmonary edema, shock, and death. The role of medication therapy in cardiac tamponade is limited. 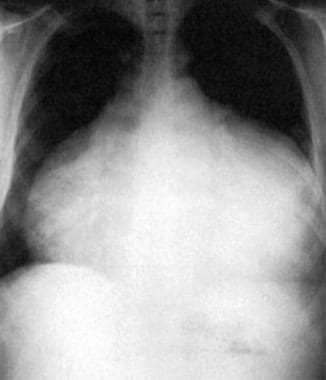 This anteroposterior-view chest radiograph shows a massive, bottle-shaped heart and conspicuous absence of pulmonary vascular congestion. Reproduced with permission from Chest, 1996: 109:825. The pericardium, which is the membrane surrounding the heart, is composed of 2 layers. The thicker parietal pericardium is the outer fibrous layer; the thinner visceral pericardium is the inner serous layer. The pericardial space normally contains 20-50mL of fluid. Pericardial effusions, which cause cardiac tamponade, can be serous, serosanguineous, hemorrhagic, or chylous. The underlying process for the development of tamponade is a marked reduction in diastolic filling, which results when transmural distending pressures become insufficient to overcome increased intrapericardial pressures. Tachycardia is the initial cardiac response to these changes to maintain the cardiac output. Systemic venous return is also altered during tamponade. Because the heart is compressed throughout the cardiac cycle due to the increased intrapericardial pressure, systemic venous return is impaired and right atrial and right ventricular collapse occurs. Because the pulmonary vascular bed is a vast and compliant circuit, blood preferentially accumulates in the venous circulation, at the expense of LV filling. This results in reduced cardiac output and venous return. The amount of pericardial fluid needed to impair diastolic filling of the heart depends on the rate of fluid accumulation and the compliance of the pericardium. Rapid accumulation of as little as 150mL of fluid can result in a marked increase in pericardial pressure and can severely impede cardiac output,  whereas 1000 mL of fluid may accumulate over a longer period without any significant effect on diastolic filling of the heart. This is due to adaptive stretching of the pericardium over time. A compliant pericardium can allow considerable fluid accumulation over a long time period without hemodynamic compromise. The incidence of cardiac tamponade is 2 cases per 10,000 population in the United States. Approximately 2% of penetrating injuries are reported to result in cardiac tamponade. In children, cardiac tamponade is more common in boys than in girls, with a male-to-female ratio of 7:3. In adults, cardiac tamponade appears to be slightly more common in men than in women. A male-to-female ratio of 1.25:1 was observed at the author's referral center, based on the International Classification of Diseases (ICD) code 423.9. However, a male-to-female ratio of 1.7:1 was observed at another level 1 trauma center. Cardiac tamponade related to trauma or HIV is more common in young adults, whereas tamponade due to malignancy and/or renal failure occurs more frequently in elderly individuals. Cardiac tamponade is a medical emergency. The prognosis depends on prompt recognition and management of the condition and the underlying cause of the tamponade. Untreated, cardiac tamponade is rapidly and universally fatal. In addition to treatment for the tamponade, all patients should also receive treatment for the condition’s underlying cause in order to prevent recurrence. Reddy PS, Curtiss EI, Uretsky BF. Spectrum of hemodynamic changes in cardiac tamponade. Am J Cardiol. 1990 Dec 15. 66(20):1487-91. [Medline]. Saito Y, Donohue A, Attai S, et al. The syndrome of cardiac tamponade with "small" pericardial effusion. Echocardiography. 2008 Mar. 25(3):321-7. [Medline]. Parvez N, Carpenter JL. Cardiac tamponade in Still disease: a review of the literature. South Med J. 2009 Aug. 102(8):832-7. [Medline]. Ernst E, Zhang J. Cardiac tamponade caused by acupuncture: a review of the literature. Int J Cardiol. 2011 Jun 16. 149(3):287-9. [Medline]. Rylski B, Siepe M, Schoellhorn J, Beyersdorf F. Endoscopic treatment for delayed cardiac tamponade. Eur J Cardiothorac Surg. 2010 Feb. 37(2):490-1. [Medline]. Mujovic N, Marinkovic M, Markovic N, et al. Management and outcome of periprocedural cardiac perforation and tamponade with radiofrequency catheter ablation of cardiac arrhythmias: a single medium-volume center experience. Adv Ther. 2016 Oct. 33(10):1782-96. [Medline]. Holmes DR Jr, Nishimura R, Fountain R, et al. Iatrogenic pericardial effusion and tamponade in the percutaneous intracardiac intervention era. JACC Cardiovasc Interv. 2009 Aug. 2(8):705-17. [Medline]. Hindi Z. Rare purulent cardiac tamponade caused by Streptococcus constellatus in a young immunocompetent patient: case report and review of the literature. Am J Case Rep. 2016 Nov 16. 17:855-9. [Medline]. You SC, Shim CY, Hong GR, et al. Incidence, predictors, and clinical outcomes of postoperative cardiac tamponade in patients undergoing heart valve surgery. PLoS One. 2016 Nov 17. 11(11):e0165754. [Medline]. Haneya A, Diez C, Kolat P, et al. Re-exploration for bleeding or tamponade after cardiac surgery: impact of timing and indication on outcome. Thorac Cardiovasc Surg. 2015 Feb. 63(1):51-7. [Medline]. Le J, Buth KJ, Hirsch GM, Legare JF. Does more than a single chest tube for mediastinal drainage affect outcomes after cardiac surgery?. Can J Surg. 2015 Apr. 58(2):100-6. [Medline]. Cornily JC, Pennec PY, Castellant P, et al. Cardiac tamponade in medical patients: a 10-year follow-up survey. Cardiology. 2008. 111(3):197-201. [Medline]. Lee YM, Kim HJ, Lee JE, et al. Cardiac tamponade following insertion of an internal jugular vein catheter for hemodialysis. Clin Nephrol. 2009 Sep. 72(3):220-3. [Medline]. Roy CL, Minor MA, Brookhart MA, Choudhry NK. Does this patient with a pericardial effusion have cardiac tamponade?. JAMA. 2007 Apr 25. 297(16):1810-8. [Medline]. Ikematsu Y. Incidence and characteristics of dysphoria in patients with cardiac tamponade. Heart Lung. 2007 Nov-Dec. 36(6):440-9. [Medline]. Sagrista-Sauleda J, Angel J, Sambola A, Alguersuari J, Permanyer-Miralda G, Soler-Soler J. Low-pressure cardiac tamponade: clinical and hemodynamic profile. Circulation. 2006 Aug 29. 114(9):945-52. [Medline]. Busko, M. ESC group issues triage strategy to manage cardiac tamponade. Medscape Medical News. July 10, 2014. Available at https://www.medscape.com/viewarticle/828091. Accessed: July 21, 2014. Ristic AD, Imazio M, Adler Y, et al. Triage strategy for urgent management of cardiac tamponade: a position statement of the European Society of Cardiology Working Group on Myocardial and Pericardial Diseases. Eur Heart J. 2014 Sep 7. 35(34):2279-84. [Medline]. Towbin R. The bowed catheter sign: a risk for pericardial tamponade. Pediatr Radiol. 2008 Mar. 38(3):331-5. [Medline]. Gold MM, Spindola-Franco H, Jain VR, Spevack DM, Haramati LB. Coronary sinus compression: an early computed tomographic sign of cardiac tamponade. J Comput Assist Tomogr. 2008 Jan-Feb. 32(1):72-7. [Medline]. Stone MK, Bauch TD, Rubal BJ. Respiratory changes in the pulse-oximetry waveform associated with pericardial tamponade. Clin Cardiol. 2006 Sep. 29(9):411-4. [Medline]. Boltwood C, Rieders D, Gregory KW. Inspiratory tracking sign in pericardial disease. Circulation. 1984. 70(suppl II):103. Petcu DP, Petcu C, Popescu CF, Bataiosu C, Alexandru D. Clinical and cytological correlations in pericardial effusions with cardiac tamponade. Rom J Morphol Embryol. 2009. 50(2):251-6. [Medline]. Sagrista-Sauleda J, Angel J, Sambola A, Permanyer-Miralda G. Hemodynamic effects of volume expansion in patients with cardiac tamponade. Circulation. 2008 Mar 25. 117(12):1545-9. [Medline]. Motas C, Motas N, Rus O, Horvat T. Left paraxiphoidian approach for drainage of pericardial effusions. Interact Cardiovasc Thorac Surg. 2010 Jan. 10(1):4-5. [Medline]. Monaco F, Barone M, David A, et al. [Cardiac tamponade: a modified video-assisted thoracoscopic approach] [Italian]. Chir Ital. 2009 May-Jun. 61(3):321-6. [Medline]. Shiota T. Role of echocardiography for catheter-based management of valvular heart disease. J Cardiol. 2017 Jan. 69(1):66-73. [Medline]. Khanna S, Maheshwari K. Hemopericardium and acute cardiac tamponade. Anesthesiology. 2018 May. 128(5):1006. [Medline]. Lopez PD, Valvani R, Mushiyev S, Visco F, Pekler G. Cardiac tamponade: an unusual presentation of systemic lupus erythematosus. Am J Med. 2018 May. 131(5):e189-e190. [Medline]. Appleton C, Gillam L, Koulogiannis K. Cardiac tamponade. Cardiol Clin. 2017 Nov. 35(4):525-37. [Medline]. Fernandez Morales A, Iniesta N, Fernandez-Codina A, et al. Cardiac tamponade and severe pericardial effusion in systemic sclerosis: report of nine patients and review of the literature. Int J Rheum Dis. 2017 Oct. 20(10):1582-92. [Medline]. Chen X, Miao Q, Yu Y, et al. Blunt trauma-induced pericardial tamponade after video-assisted thoracoscopic surgery. Ann Thorac Surg. 2018 Nov 24. [Medline]. Doukky R, Improvola G, Shih MJ, et al. Usefulness of oximetry paradoxus to diagnose cardiac tamponade. Am J Cardiol. 2018 Nov 6. [Medline]. A 12-lead electrocardiogram showing sinus tachycardia with electrical alternans. Reproduced with permission from Chest, 1996; 109:825. Early diastolic collapse of right ventricular free wall (subcostal view). Early diastolic collapse of right ventricular free wall (parasternal short-axis view at aortic valve). Late diastolic collapse of right atrium (subcostal view).